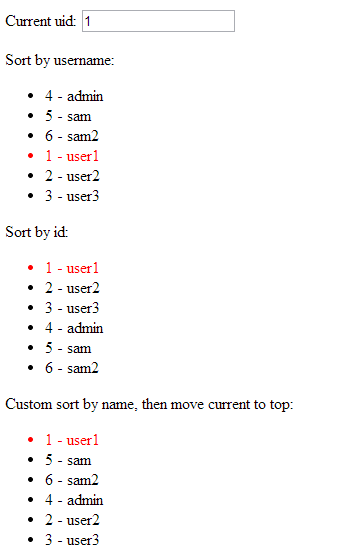 Update 31/07/2014: Added orderBy:’username’ which sorts the list before moving the current user to top. Thanks mate, removed the random if (. Not sure what you mean about the orderBy though it’s in the jsfiddle examples. What I meant was that the final example says “Custom sort by name, then move current to top” and in the HTML you have data-ng-repeat=”u in users | currentUserToTop:user.id”. This certainly does move current to top, but there is no custom sorting by name. In this example the items are in the same order they are in the controller (except the current is at the top). Changing the HTML to data-ng-repeat=”u in users | orderBy:’username’| currentUserToTop:user.id” sorts the list by name and then moves the current to top. Ah that makes sense now, thanks Tyler.